'Planting a garden is an act of optimism. We're putting our trust in the future when there's no present sign that life will come," writes Marilyn Barrett in Creating Eden: The Garden As A Healing Space. It's a hobby that brings internal as well as external rewards, and retired Waterford Crystal craftsman Martin Hodgers is in full agreement. The 62-year-old's greatest horticultural achievement to date is growing watermelons. It was a trial and error learning process. "The first year I grew them we had loads, big as footballs. The next two years, I didn't get any. I had a friend of mine looking it up on one of these gadget phones. We got in contact with a fella in California, he actually made a little video on how to pollinate the watermelons yourself. So we did that, and it worked." Martin shares the work with his neighbours at Respond housing association's Airmount community garden in Waterford. "This year we tried something totally different again because of the good summer," Martin explains. "It's called Shake 'n' Rake: you just shake all these seeds of flowers into your beds, cover them with compost, flatten them down, and all different kinds of flowers grow. We got a lovely blue flower, I think they're a Mediterranean flower, and the bees were mad about them. So the bees were landing on those and going straight into the polytunnnel for us and helping with the work." The results off the bees' help were magnificent. "We grow all our tomatoes from seed. Different types - the tigerellas, the moneymakers, the cherries - but my favourite would be the big beef ones," says Martin. "Beautiful. There's a totally different taste off your own tomatoes. They're not like the ones you get in the shops, put it that way. You just pick them into your hand and eat them." 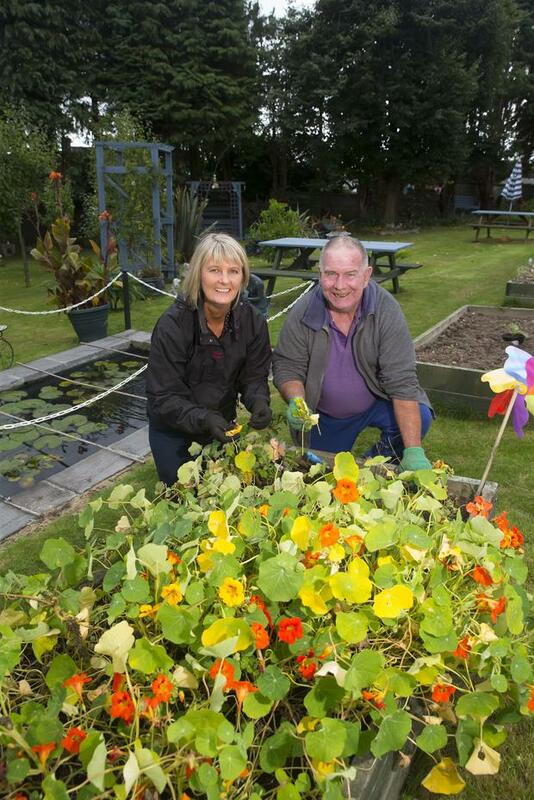 Respond support worker Ellie Gaffney is one of the mentors behind the success of the garden project. She was hired to help older people to live independently for as long as possible in their homes. "When I came on board I could see, yes, everybody had their lovely apartment, but there was no community development," recalls Ellie. "They'd say hello and then just go into their apartment and be there all day on their own. So my thought was, 'How can we change this?'" Ellie contacted the national organisation Age & Opportunity for help with setting up weekly stretching exercise activities. "I had 16 involved, but I was looking at the other tenants who weren't old enough to do chair-based exercises. What was going to get these guys out doing something?" The answer was a community garden project. "I had to go to my own manager to get the land. We put in 27 allotment beds, with seven high beds for people who couldn't bend down. Since 2012 it's a whole different place up there," says Ellie. "The GIY Grow It Yourself group gave us a grant for a polytunnel. And the Education and Training Board gave us a horticulture tutor for 10 weeks." It all blossomed from there, of course, and not just in terms of the wholesome homegrown produce. "We saw that if somebody had to go up to their apartment they might not come back again so we put in a little kitchen and toilet. Now they'll shout: 'Eleanor, do you want a cup of tea? We're putting the kettle on.' It's kind of a place for chatting, it's not just the garden. "Some people who had big issues with alcohol have turned their lives around. People who were really suffering with depression - just sitting in their apartments all day, not being involved, with nobody talking to them - now are out and you can see them and hear them laughing and blackguarding. "Lanterns were put up in the summer, one of the tenant's sons was home from Australia and they had a tea party for him in the evening and they invited all the residents," adds Ellie. "There's a common interest in what they all grow - they all share lettuce, potatoes, tomatoes, even melon. That's what it's about. It wasn't about what they can grow or what they can't grow. It was about giving them their own community and friendship." Such green-fingered innovation is promoted by Ireland's Royal Horticultural Society, which has 900 individual members and 40 show gardens, including Gash Gardens in Laois and Fota House in Cork. RHSI members get free or reduced-price entry to the show gardens and access to workshops, plant sales, exhibitions and flower shows. Upcoming events include a gardening for wildlife session this month (September 29) with John Anderson, the keeper of Windsor Great Park in the UK. "Even the medical side of it, the therapeutic benefits of gardening, are fantastic," says RHSI spokeswoman Peggy Masterson. The Back Of The Pipes residents' association in Dublin 8 joined forces with World Rugby volunteers earlier this year to shake up their local gardening project. The heavy lifting included the installation of a new frog pond and a pizza oven. "You don't even have to be interested in gardening. If all you want to do is just sit in a garden that'll do too," says local man Frank Shaughnessy. "I drifted into it through my hobby of photography. People would say, 'We're running an event in the garden, will you come down and take a photograph?' And then Dougal Hazel (who helped to set up the project) would say, 'Do you want to give me a hand with this?' and so I got into planting in the garden and whatever needed to be done. "It's a social thing as well because I don't go to pubs. It's a lovely night out where you do something for the community," adds Frank. "And it's healthy. That's the main thing. Getting outdoors is a very important part of it, not to be cramped up in the house. I'm a keen meditator so I love to sit in it in the evening, close my eyes and listen to the world going by. "Now, if you went down sometimes you might say 'what is he talking about? ', because it can be like a bomb hit it. There's so much work going on. But that's the nature of it, the thrill of it - it's a bit higgledy piggledy, and there's always something new or some social event." Galway City Council has two community gardens, in Shantalla and Merlin Woods. Kenneth McSharry in the amenities department says it was a slow burner at the beginning. "The interest wasn't there. Gradually, over time, Stephen Walsh (the city parks superintendent) got people to think about it, sort of wore them down a little bit. It's just trying to present the benefits. "The main thing is people are getting out in fresh air, they're getting some physical exercise and they're socialising. Not just for elderly people, that applies too to our younger plot holders." Kenneth mentions British research on depression which showed that the annual fee for an allotment is only a fraction of what people pay for comparable medicine or treatment. "It probably does apply to all of us too. I know certain green colours are very restful. There's probably about 200 shades of green. They're very relaxing and they get people in a very mellow mood. It's good for you in general to get out there." Back in Waterford, Ellie Gaffney says that at the rate the project is growing, a tasty new Deisce wine could be the next milestone. "For people who have never grown anything or been involved in a garden, it's amazing. They're trying to get the knack of growing grapes! So far they just die off on them but we're still trying and they're still working away at it."